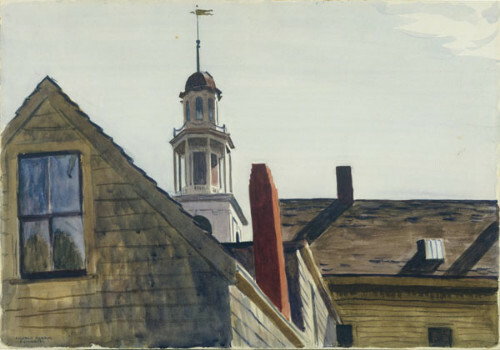 The Cape Ann Museum will present a guided walking tour of select Gloucester houses made famous by American realist painter Edward Hopper on Friday, August 7 at 10:00 a.m. Tours last about 1 1/2 hours and are held rain or shine. Participants should be comfortable being on their feet for that amount of time. Cost is $10 for Cape Ann Museum members; $20 for nonmembers (includes Museum admission). Space is limited and reservations are required. Email info@capeannmuseum.org or call (978) 283-0455 x10 for more information or to reserve a space. The Hopper’s Houses tour will also be offered on August 15, August 22, September 5 and September 12 . American realist painter Edward Hopper is known to have painted in Gloucester on five separate occasions during the summer months in the years 1912, 1923, 1924, 1926 and 1928. His earliest visit in 1912 was made in the company of fellow artist Leon Kroll. During his second visit to Cape Ann in 1923, Hopper courted the young artist Josephine Nivison. He also began working in watercolor, capturing the local landscape and architecture in loosely rendered, light filled paintings. In 1924, Hopper and Nivison who were newly married returned to Gloucester on an extended honeymoon and continued to explore the area by foot and streetcar. During his final two visits to the area, in 1926 and 1928, Hopper produced some of his finest paintings. This special walking tour will explore the neighborhood surrounding the Museum, which includes many of the Gloucester houses immortalized by Hopper’s paintings. The recently renovated Cape Ann Museum celebrates the art, history and culture of Cape Ann – a region with a rich and varied culture of nationally significant historical, industrial and artistic achievement. The Museum’s collections include fine art from the 19th century to the present, artifacts from the fishing & maritime and granite quarrying industries, textiles, furniture, a library/archives, and two historic houses. For a detailed media fact sheet please visit . The Museum is located at 27 Pleasant Street in Gloucester. Hours are Tuesday through Saturday from 10:00 a.m. to 5:00 p.m., and Sundays from 1:00 p.m. to 4:00 p.m. Admission is $10.00 adults, $8.00 Cape Ann residents, seniors and students. Youth (under 18) and Museum members are free. For more information please call: (978)283-0455 x10.